You don't need to be a professional astronomer to find new worlds orbiting distant stars. Darwin mechanic and amateur astronomer Andrew Grey this week helped to discover a new exoplanet system with at least four orbiting planets. The discovery was a highlight moment of this week's three-evening special ABC Stargazing Live, featuring British physicist Brian Cox, presenter Julia Zemiro and others. 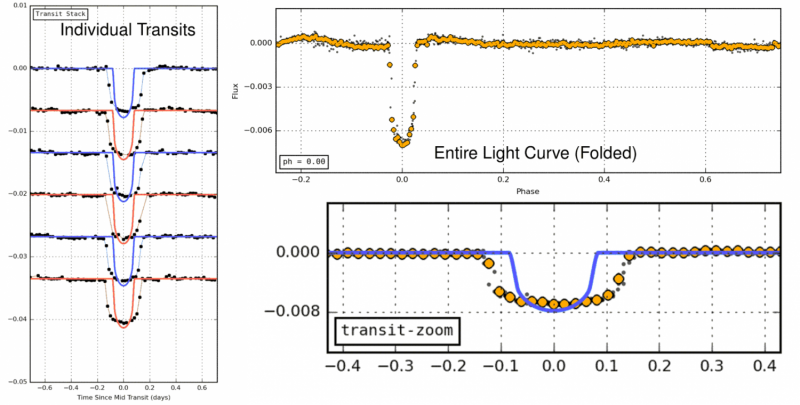 Viewers were encouraged to join in the search for exoplanets – planets orbiting distant stars – using the Exoplanet Explorers website. After a quick tutorial they were then asked to trawl through data on thousands of stars recently observed with NASA's Kepler Space Telescope. Together with other co-discoverers, Grey's name will appear on a scientific paper reporting the very significant discovery of a star with four planets, orbiting closer to the star than Mercury is to our Sun. "That is amazing. Definitely my first scientific publication … just glad that I can contribute. It feels very good." "In the seven years I've been making Stargazing Live this is the most significant scientific discovery we've ever made." So just what does this discovery signify? First, let's be clear: this is no publicity stunt, or a bit of fake news dressed up to make a good story. It will help us understand the formation of our own Earth. It's also a step towards establishing whether we are alone in the universe, or whether there are other planets populated by other civilisations. If Grey and his colleagues hadn't discovered this new planetary system, then somebody else would have eventually discovered it. But that can be said of all discoveries. The fact remains that this particular discovery was made by Grey and his fellow citizen scientists. As I said earlier, Grey didn't make this discovery alone. He used data from the Kepler spacecraft with a mission cost of US$600 million. Although we can build stunning telescopes that produce vast amounts of valuable data, we can't yet build an algorithm that approaches the extraordinary abilities of the human brain to examine that data. But the brains don't need to be trained astrophysicists, they just need to have the amazing cognitive abilities of the human brain. This is happening all over science and even the arts, from butterfly hunting to transcribing Shakespeare's handwriting. Will machines ever make citizen scientists redundant? I have argued before that we need to build algorithms called "machine scientists" to make future discoveries from the vast volumes of data we are generating. I see the power of citizen scientists continuing to grow. I suspect this is only the start. We can do much more. We can increase the "fun" of doing citizen science by introducing "gaming" elements into citizen science programs, or by taking advantage of new technologies such as augmented reality and immersive virtual reality.